I’m young enough that when I first watched Doctor Who, it was the new era of the show rather than the classic series. So when the Daleks were about to make their big comeback after decades off screen—after being told that they had sent countless Who viewers before me scurrying behind their sofas in dread—I couldn’t wait to be scared by the legendary pepperpots of doom. The episode “Dalek,” as it turns out was pretty good. But I was confused. Sure, its titular villain yelled “Exterminate!” in a shrill, robotic voice. It killed a ton of people, and was seemingly unstoppable. It could also fly up stairs, which was apparently a big deal back then (oh, such innocent times). But I wasn’t afraid of the Dalek. It was a hateful, vindictive creature, but I didn’t really fear its power. When the Daleks came back for the finale, “Bad Wolf/The Parting of the Ways,” the fact that there was a whole fleet of them wasn’t particularly scary to me either. Their angry yelling multiplied and the stakes were raised, but the Daleks were always just a cool villain to me, not a scary one. It’s the moment in the Cybermen’s return in “Rise of the Cybermen/The Age of Steel” that really shows the horror of what the Cybermen are, as well as the tragedy at their core. And because of it, I’ve been in love with them ever since. Admittedly, it has been a strained love at times. Their perennial-second-place in the monster rankings has been earned by the fact that many Cybermen stories (both in the classic series and the revived Doctor Who) have been robbed of the pathos that defines their concept, and treated at best as a zombie horde, at worst a second rate Dalek knockoff (one of the biggest mistakes of the otherwise solid “Rise of the Cybermen/The Age of Steel” was to give them “Delete, Delete, Deeeeleeeete!” as a catchphrase). There have been too many times when the Cybermen are pretty much chumps, bested by silly things like overwhelming emotions, gold, or even guns that shoot emotions. Is it any wonder the Daleks always take the top prize in the best monster polls, when the show can’t manage to tell a Cyberman story that makes them both fearsome and pitiable? 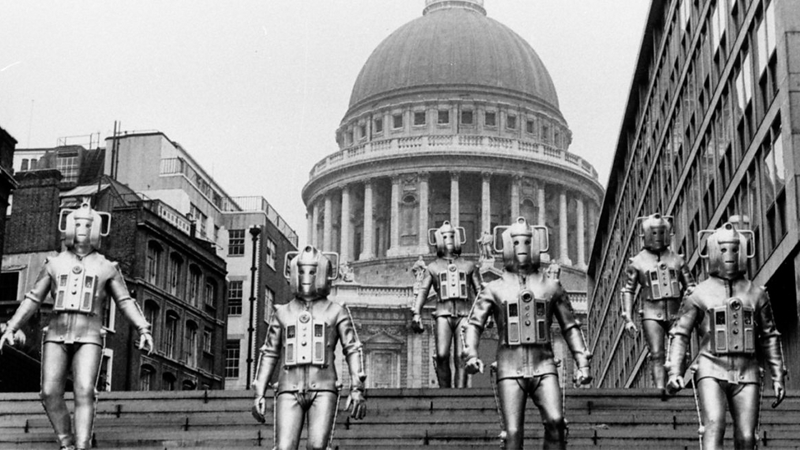 The Cybermen march from St. Paul’s Cathedral in “The Invasion”, one of the most iconic images in Doctor Who history. But when Doctor Who can nail both sides of the Cybermen—like it did so wonderfully in the recent first half of this season’s finale, “World Enough and Time”—they’re incomparable as one of the show’s most potent dramatic forces. They could be anyone you know, transformed into something that’s still human enough to have you wonder what horror lies behind the silver plating and cybernetics—even if the victims themselves never can, because their own humanity has been scooped out of them, replaced with metal parts and an inability to feel. And, depending on the Cybermen you’re talking about, this is made all the more tragic because it’s done out of a desperate need to survive. 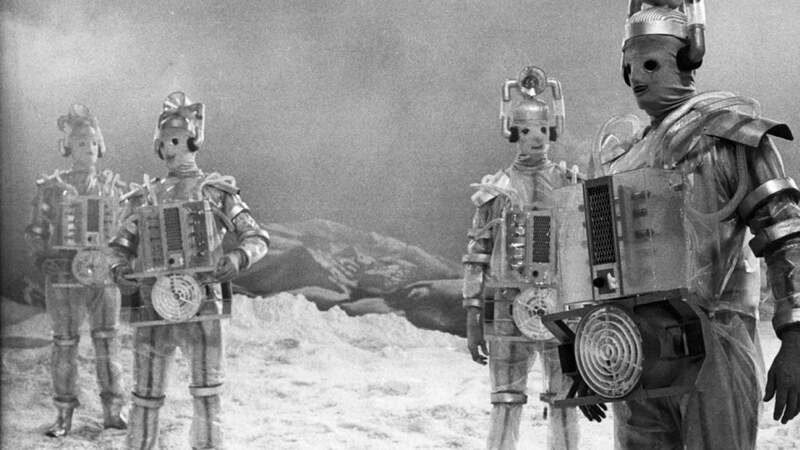 The original Cybermen in “The Tenth Planet”—still the best design. In their original form, the Cybermen were from Earth’s twin planet, Mondas—a world that was dying, so its people turned to the operating table to adapt, and in the process became something gruesomely different. They don’t potter around the galaxy skulking in the shadows because they’re hateful world-conquerors like the Daleks. They just want to survive, avoiding extinction by any means necessary, even at the cost of their humanity. The Cybermen represent one of scifi’s most interesting quandaries—what we are willing to do to ourselves to survive, and how will we keep ourselves human in the process—wrapped up and encased in a suit of metal and flesh. Their faces are blank and emotionless, but they’ve also borne witness to such horrifying tragedy in the search for survival is what makes the Cybermen so unnerving—there’s such a mix of powerful emotion behind the idea of the Cybermen, but it’s something they themselves can never experience. That’s why I will always fear them as Doctor Who’s finest foe—and love them, too.